Q: I spend a lot of time trying to kill algae, and sometimes it doesn’t work. Do you have any tips? A: Frustrating, isn’t it? You spend hours upon hours pondside, dosing the water with algaecides and raking out algae-feeding plant matter and detritus, only to see the green menace return weeks – if not days – later. Is there a way to control the nuisance algae that’s turning your pond into pea soup? You bet. Below are our top recommendations for battling the algae. If you follow these guidelines, you’ll have that green menace under control in no time. When using algae control products in your pond or lake, the algae must be present and actively growing. Why? Because the chemicals need to make direct contact with the tiny organisms and absorb into their cells for them to be effective; if there’s no living algae, the chemicals will land in the water and become diluted, and therefore ineffective when the green stuff blooms. Algae can grow in cold temperatures – even frigid, depending on the species – but algaecides aren’t so tolerant. The pond water must be warmer than 60°F for the chemicals in them to work. Apply your algae treatment on a sunny, mild day when rain is not expected in the immediate forecast. This will allow the chemicals to adequately absorb into the algae. As always, read the product label for instructions and specific temperature requirements. When temperatures heat up and the algae dies off, that combination of warm water and decaying plant matter reduces the amount of oxygen available to fish and other living critters in the pond. Keep them in an oxygen-rich environment by treating the pond in small sections and wait 7-10 days before moving to the next section. In addition, keep your aeration system or fountains running during treatment to continue circulating and oxygenating the water. Different algaecides have different active ingredients, inert ingredients and specifications, so always read your product’s label for appropriate protective equipment and application rates. Pay special attention to warnings concerning water use and restrictions in ponds used for irrigation, drinking and swimming, as well as in ponds that house certain types of fish. If you have trout, which are sensitive to copper-based treatments, test the carbonate hardness levels and ensure they are above 50 ppm prior to treatment. If they’re above that, use another treatment, like Hydrothol®, that contains no copper. Algaecides are a great tool that can temporarily clear up pea soup water, but they do little address the actual problem causing the algae – which is excessive nutrients and organics. By following your treatment up with proactive pond management practices, such as aeration and natural water treatments like MuckAway™, you will reduce the accumulation of dead organic material, which will help to keep your water clear season after season. Check out the Airmax® Ecosystem™ – Proactive Pond & Lake Management video below for more information or view the article here. Pond Talk: Do you have any additional tips for successful algae management? Q: How do I start up my aeration system for the spring? A: If your Airmax® Aeration System has been sitting idle for the past four months, it’s about time to get that thing cranking again. Here’s a seven-step checklist to follow when air and water temperatures start heating up this spring. Change Your Air Filter: Your air filter, which prevents debris from entering your air compressor, can be cleaned periodically to remove light debris – but it should be replaced every three to six months for maximum system performance and longevity. Check, Clean Side Intake Air Filters: Take a look at your side intake air filters on your cabinet, too, and make sure they’re clean and unobstructed. Ensure Cabinet Fan Works: To make sure fresh air will tunnel evenly through your cabinet, flip on your fan and verify that it’s working properly. Purge Membrane Diffuser Sticks: Though they’re virtually maintenance-free, these diffuser sticks, which deliver the air bubbles to the water, should be purged and inspected before they’re submerged. Airlines Cleared: It could still be icy in your pond, so check your airlines for ice buildup. To clear them, pour 1 cup of isopropyl alcohol through the airline running out to each plate, turn on the compressor and push through the line to free any tiny icebergs. Start Your Engines – Gradually: To prevent shocking your pond, follow your aeration system’s initial seven-day startup procedure. On Day 1, run the system for 30 minutes and then turn it off for the rest of the day. On each day following, double the time: Day 2, run for one hour; Day 3, run for two hours; Day 4, run for four hours; and so on. On Day 7, begin running it for 24 hours a day, seven days a week. Pressure Check: Once your system is up and running, make sure that its pressure gauge stays within the normal range of 5 to 10 psi. An easy way to do this to mark the gauge upon initial start up and check it regularly to verify pressure has not significantly risen above or dropped below your initial reading. Following these simple steps will guarantee a smooth start to aerating your pond this spring. If you’re ever in doubt, check out your owner’s manual or contact one of the experts at The Pond Guy®. Pond Talk: Are you planning to add any fish or plants to your pond this spring? Q: I think my aeration airline is clogged or frozen. What should I do? Gauge Check: First of all, check your air pressure gauge. Is it reading higher than normal? If so, your compressor is struggling to push the air through the blockage, which is creating increased pressure in the line. System Check: Next, disconnect the airline at the compressor and check to see whether air is coming out. If it is, your compressor works just fine – but your airline might have ice blockages. To melt them and open the flow back up, pour 1 cup of isopropyl alcohol through each airline (or the airline you believe is clogged or frozen). Maintenance Check: If no air is coming out of your compressor, you might need to do some maintenance on it. Over time, seals and moving parts will wear and break down, causing decreased system performance. The Airmax® SilentAir™ Piston Compressor Maintenance Kits include a range of washers, gaskets and hardware that will get your compressor humming again. Air Filter Check: While you’re doing maintenance on your air compressor, it’s a good idea to check your air filter, too. If it’s full of gunk and debris, consider replacing it with the SilentAir™ RP Series Compressor Air Filters. They’re designed to be replaced every three to six months for maximum system performance and longevity. Pond Talk: Have you had a lot of trouble with frozen airlines this winter? Q: I am going to add an aeration system this year to my 1-acre pond. What are my options? A: Now that’s something we like to hear! Aerating a pond, which involves pumping life-sustaining oxygen into the water via a bottom diffuser, is good for your fish, good for your water quality, and good for minimizing algae blooms. It can be tricky figuring out the right aeration system for a pond, particularly if it’s oddly shaped, but it’s important to get it right. If your aeration system is not sized correctly, you could risk reducing the oxygen levels and building up toxic gas in the water, resulting in an increased chance of fish kills, algae blooms and thick pond muck – not something you want in your pond. 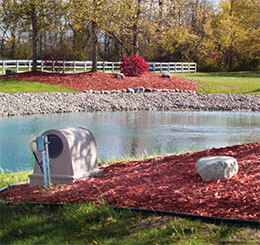 We offer aeration options for ponds of all sizes and shapes. Choosing the best Airmax® Aeration System for your pond will depend on two basic factors: your pond’s volume and its shape. You need to know your pond’s water volume in order to select a unit that’s capable of circulating and oxygenating all the wet stuff in your pond. To calculate your pond’s volume, you’ll need to measure its length, width and depth. Of those numbers, depth is the most critical component when choosing an aeration system. The deeper your pond, the more efficiently and effectively a bottom diffuser plate will aerate it. If your pond is shallow or irregularly shaped, you’ll need more diffuser plates to adequately aerate the water. Shallow Water Series™ Aeration System: We suggest this system for ponds up to ½ acre and up to 6 feet deep that require multiple aeration plates due to depth restrictions. It’s designed to provide maximum aeration and circulation in even the shallowest water bodies via its powerful dual-diaphragm compressor and weighted diffusers. Pond Series™ Aeration System: We recommend this single-plate to four-plate system for ponds up to 4 acres, up to 21 feet deep. It can be easily adapted to fit small or odd-shaped ponds for maximum aeration and even circulation. Lake Series™ Aeration System: For ponds up to 6 acres, up to 50 feet deep, try this system that’s capable of aerating even the largest ponds and lakes. It features a more spacious Airmax® Composite Cabinet with enhanced cooling and minimal maintenance. Finally, pond shape plays an important role in ensuring proper aeration. For simple, contiguous shapes like circles and ovals, a standard aeration system like the Pond Series or Lake Series will fully circulate all of the water without the risk of stagnation. If you have an odd-shaped lake or one with interconnecting segments and angles, consider using a system with multiple aeration plates. Now sure how to calculate your pond volume or choose the best aeration system for your pond or lake? Call us at 866-766-3435 for our free aerial mapping service, or use our Online Aeration Mapping Service for sizing. We’ll help you to make the right aeration decision – for you and your pond! Pond Talk: What advice would you give to someone installing an aeration system for the first time? Q: I think my aerator is undersized but how do I know? A: As you probably know, proper aeration with a deep water or shallow water aeration system is key to a healthy pond or lake. When water circulates and moves, oxygen flows throughout the water column, the water temperature is even, and the fish and wildlife thrive. You’ll see no stagnant areas or catch whiffs of bad odors. Instead, you’ll have a welcoming, enjoyable body of water, perfect for play and recreation. If you think your aerator isn’t doing its job, it’s easy to diagnose: Just take your pond’s temperature! To begin, you’ll need a non-floating pond thermometer, a long string, a tape measure, a waterproof marker, a stopwatch, and a pad of paper and pencil. Tie the string to your thermometer, and measure and mark every 24 inches down the length of the string with your waterproof marker. Once your tools are set up, gather them together, hop in your boat and motor to various locations in your pond. At each spot, noting where you are, drop the thermometer into the water and take the water’s temperature readings 24 inches down at a time, from the top to the bottom. Let the thermometer rest long enough (5 to 10 minutes) to get the true temperature reading at your desired depth. Repeat this process in different areas (particularly if your lake is unevenly shaped), taking notes all along the way. Once you’re done taking your lake’s temperature, look at your notes. Is there more than a few degrees difference in any of your temperature readings? If so, you’re more than likely under-aerating your pond. The good news is that The Pond Guy® offers a free aerial mapping service. We’ll measure your pond and tell you where the diffusers should be placed so that you’re getting even aeration throughout the body of water. Take advantage of this free service! Your fish will thank you for it! Pond Talk: Do you have any tips for taking your lake’s temperature? Q: I bought an aeration system this year. What maintenance should I be doing? Check Your Cooling Fan and Pre-Filter: Regularly clean out your pre-filter and check to see that the fan is indeed operating. Hot air should be blowing out, not air being pulled in. An easy way to remember to do this is to always check your fan and shake off your pre-filter when you cut your lawn. Check Your Air Pressure: Check to see that your air pressure has not risen or dropped significantly. Normal operation will range between 5 and 10 psi. Also be sure to check your pressure relief valve to make sure no air is escaping. Check Your Air Filter: Clean and replace your air filter every three to six months, depending on your environment, and do not place a wet air filter back into the unit. For deep-water units, use the Airmax® SilentAir™ Piston Compressor Air Filter; for shallow-water units, use the Airmax® SilentAir™ LR Series Air Filter. Purge Your Membrane Sticks: Once per year, purge your membrane diffuser sticks. See the product manual for additional instructions. Use the Maintenance Kit: Finally, be sure to use your maintenance kit for the system you have installed. For shallow-water systems, use the Airmax® SilentAir™ Diaphragm Compressor Maintenance Kit every 12 months to keep your diaphragm compressor running its best. For deep-water systems, use the Pond Logic® SilentAir™ Piston Compressor Maintenance Kit every 24 months to keep your piston compressor humming. Remember, if you have any questions, need additional information or want to read through some troubleshooting tips, refer to your product manual. Pond Talk: What is your aerator maintenance routine? Do you have any tips to share?